ASA J. SHERBURNE is a prominent and enterprising farmer of Bond County and owns one of the best-improved and most fertile farms in this part of the State. Perhaps it would be difficult to find among the farming community a man who enjoys wider popularity than he, and his biographical sketch will therefore be of interest to our readers. Asa J. Sherburne was born near Rochester, N. Y., July 11, 1827, and is the son of Henry Sherburne, also a native of New York, whose birth took place in 1799. The family is of English descent and was represented in this country before the Revolutionary War. In his younger days, Henry Sherburne followed the trade of a blacksmith and engaged in making edged tools and in mill work. Later he became a merchant and dealt in notions and dry goods. About 1856, he removed to Indiana and settled in Terre Haute, where he engaged in business for some years. His active labors ceased at the age of seventy-four years, and he passed away mourned not only by his family but throughout the entire community. He had been a valued member of the Methodist Church, In politics, he was first a Whig and a strong Abolitionist, and in later years became a Republican. The mother of our subject, Mary (Bronson) Sherburne, was born in New York and died at the age of seventy-four years. The church of her choice was the Methodist, in which she was long an active member. Mrs. Sherburne became the mother of nine children, eight of whom grew to maturity, namely: James, Jethro, Charles, Asa, Squire, William, Melvina and Lucy. Jane died at the age of eleven years. Our subject was reared in New York and was educated in the common schools of his place. At the age of sixteen, he left home and began the struggle of life for himself. At Waterloo, N. Y., he learned the trade of blacksmith and worked at it until 1851, when he made his way to Indianapolis, Ind., and engaged in work on the Vandalia Railroad, which was being built from there to Terre Haute. When the road was finished, he was engaged as engineer and ran on that line between Indianapolis to Terre Haute for nineteen years, and later from Indianapolis to St. Louis for five years as passenger conductor. Tiring of this life, in 1873 Mr. Sherburne left railroad work and bought his present farm. His marriage, April 30, 1854, united him to Mary Burton, who was born in Terre Haute, Ind., and four children have been born unto them, namely: Harry V., who married Rebecca Plumb; Cora, Mrs. Curtis C. Paddock; Lua E., Mrs. William H. Ebert; and Ned C. Our subject has two hundred and eighty acres of fine land, all in one body. The entire tract is in the highest state of improvement, except twenty acres, which he prefers to keep in timber. His commodious residence was erected in 1881 and is beautifully located on a high ridge, near the railroad on which he spent so many years. In 1886, he built the large frame barn, which is one of the most substantial improvements in that neighborhood. Mr. Sherburne has raised a great deal of wheat and also much fine stock. In political matters, he is a Republican and his popularity with the party of his choice is testified by his election to the position of School Director, which office he has held for many years. For thirty years, he has been a prominent member of the Masonic fraternity and is at present identified with the Blue Lodge, and has reached the thirty-second degree. 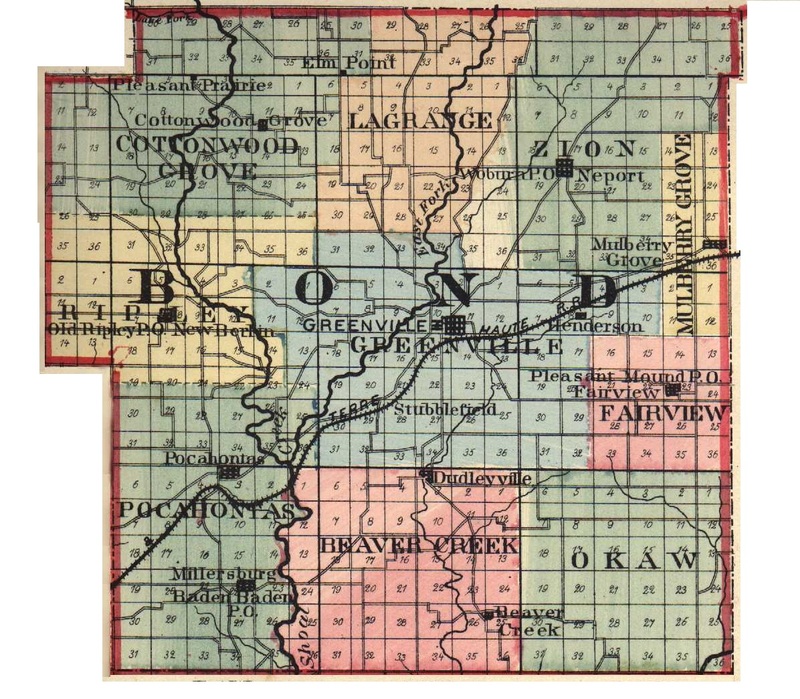 The family is highly respected and its members have made hosts of friends among the residents of that portion of Illinois embraced in the confines of Bond County. Extracted 04 Dec 2016 by Norma Hass from 1892 Portrait and Biographical Record of Montgomery and Bond Counties, Illinois, pages 193-194.